Many traders think that the Pin Bar is one of the most reliable candle patterns, where the introduction of this pattern is used both as a full strategy and combined with other strategies, so don't be surprised if you find some display indicators with names the same one. Before we continue to explain this indicator, we must remind you that the pin bar is a candle that has a short body and at least one long shadow. This pattern was created by Martin Pring, where he realized this: When the exchange is ready to spin direction, there will be "traps", and the last candle will see a "nose" that extends like the Pinocchio when he lied. This is not a joke, this pattern was first called "Pinocchio", but later the shortened name came into use. Today's topic will be very interesting, and it even seems to appear as if it has a contradiction, because many traders are accustomed to separating indicators from candlestick patterns, which means that the traders if they don't use indicators, they will use the Price Action method (they will choose one of these methods). 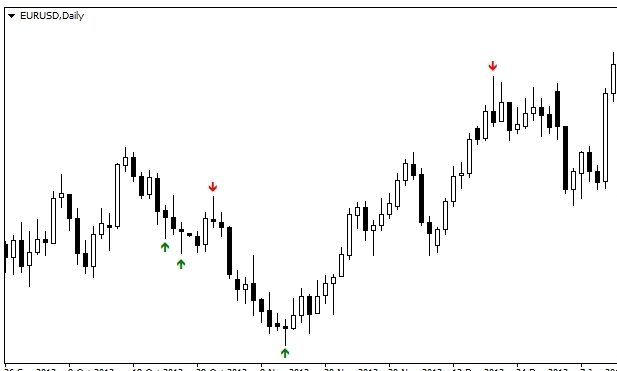 The fact is, this pin bar indicator is a very common indicator, a software that only makes the process of looking for patterns rather than candles automatically, so traders don't need to make additional calculations that can cause delays to get signals to make a position. This PinBar indicator automatically indicates bullish patterns with green arrows, where after the arrows appear, the exchange will have a very high probability of turning around after the decline, and the red arrows instead display bearish patterns, often occurs when there is a decrease in the strength of the bullish trend. We cannot mention anything about the settings, because by default this indicator has been determined and does not require any intervention from the traders, namely to avoid confusion, the creators of this indicator do not make access to change the settings in this software and only provides settings for changing colors rather than arrows that indicate price trend patterns. There is no obvious error in this case, because fake warnings often occur at any time, which is not an error that occurs because of an error in the software codes, but only because of a specific error in the field of understanding a pattern reading, i.e. You must understand theories in price action (to filter out weak patterns), and then you can start trading. It is no secret that one of the advantages of a candlestick pattern is its versatility, namely that it can be used throughout a period of time except for a period of time per minute, and a combination of several strategies in one currency pair is a phenomenon that is very often seen today. Unfortunately, not all traders, especially beginners, can have workplaces with multiple monitors (to monitor the situation at various times), perhaps because they don't see the benefit of investing in equipment before getting a stable result, or because objectively they cannot spread their attention because they have real jobs outside of trade. Other settings can be left as determined by the creator. Contrary to the indicators we discussed above, the following indicators, which are known as PinbarDetector, have been optimized for use in both types of MetaTrader terminals (written with codes mql4 and mql5). Visually, it is no different from the PinBar indicator, it's just that it uses emoticons - green for bullish patterns, red for bearish patterns - to show signals other than the use of arrows. To summarize all of this, we must note that each of the indicators we discuss today has its own advantages. For example, this PinBar indicator is very useful for beginners, the PinBar Scan indicator is very useful for traders who prefer to work at the same time with several periods of time, and the PinBarDetector indicator will be very interesting for experienced traders. 0 Response to "Pin Bar indicator: Trusted Assistant for Finding Patterns"